I hope you're having a lovely week. I've come to enjoy these mid-week updates. I sit with my coffee, reflecting upon the week. It's very contemplative. Now I don't know if it's just my perception or if I'm really like this, but I feel I generate a new crazy scheme or project every week or two. This past week's project was a contest I saw posted online called the Negotiation Challenge. It takes place in Paris in April, and attracts teams from top business schools to compete. I contacted people to arrange a team, got a tentative coach, and contacted a few people on the administration to see if they would be willing to back up the project and front some money to send the team. I then spent the rest of the day worrying that the administration would think I was crazy. Me before every project: "...I hope this works"
It's OK. I'm sure I'll have another crazy scheme great idea soon enough. I continue to forge ahead with reading Dale Carnegie's classic: How to win friends and influence people. Last week's principle was a bit more natural for me than the first week's. I tend to be forthcoming with everything by nature, both appreciation and criticism. Or at least, that's how I perceive myself. I think I did OK with this this week but honestly I wasn't keeping close track. I always try to be aware now of whether I'm being appreciative and noticing things that others do, but it's hard to think of specific instances, because it feels fake. Like "It was hard to appreciate that person, but I worked hard at it and said something nice to that scumbag." Also a failure in this area is an omission, not a commission, and so isn't the type of thing you'd notice. I guess you all will just have to let me know when I don't appreciate you enough. Yes, this does sound like an infomercial. I suppose the difference between what Carnegie suggests and snake oil salesmen is getting to a place where you are actually thinking about what other people want. 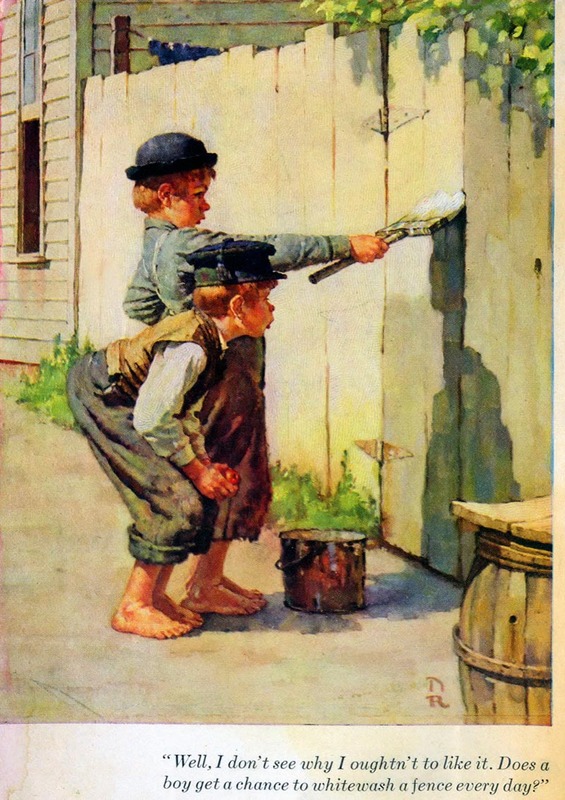 Reminds me of Tom Sawyer getting the other kids to paint the fence. Ok so I can try this. It makes sense. You go for a job interview, and instead of telling them all about how you want the job, you tell them about your qualifications and what you can bring to the company. You want your kid to eat his vegetables, you don't say "I want you to finish eating" you say "do you want to grow up big and strong?" (or maybe 'do you want to go to your room without dinner?'). I have a feeling that this is one of those points that works well in theory, but when I'm actually asking someone for something I'll forget. The pressure of the moment, don't you know. We'll see how this week unfolds. Speaking of which, if you want your friends to like you more, you should share this post with them. See everyone shares memes, rage comics and farmville requests. Your friends don't like those. More likely they'll enjoy this blog post. So go click the share buttons at the top, and you'll be the belle of the ball! I didn't notice any extra appreciation from you this week, but like you said, it has to be natural and not forced, and when not there is an omission rather than a commission, which is easier to spot. For the "frame things in terms of what people want", does this only apply to when you are asking people for things? Or rather, is that what Carnegie was referring to? Seems like it's not as general a principle as the others. Thank you, Sherri, I appreciate your comment. Carnegie's actual words were "First, arouse in the other person an eager want. He who can do this has the whole world with him. He who cannot walks a lonely way." He talks a lot in this chapter about how when we want things from people to remember that in general people care about what they want, not what we want. But the idea he's trying to get across is more generally applicable - in general appeal to people's desires.